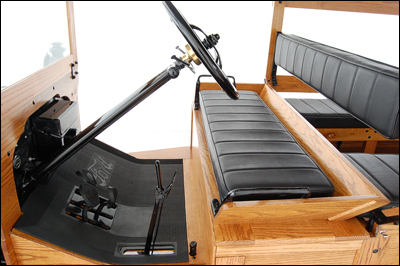 This Model T Ford has a huckster wood body, a cargo carry all with many uses. 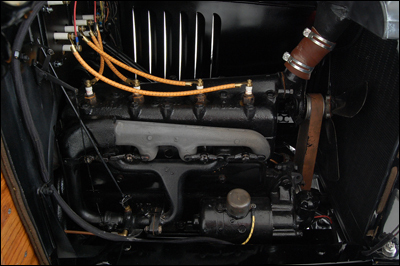 Many special use bodies were built for the Model T Ford. 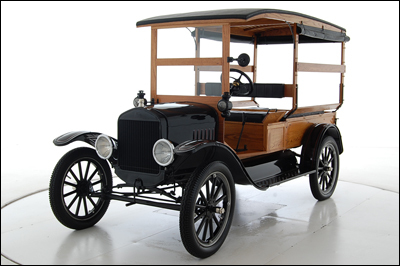 Between 1909 and 1927 fifteen million Model T Fords were built. It was the car that retired the horse and put America on wheels. There was a time when half the cars sold in America were Model Ts. “You can paint it any color, so long as it’s black.” It has never been proven that Henry Ford said this, but the phrase has survived for more than ninety years. You are looking at a body off frame total restoration. The electric starter was an aftermarket accessory. In 1924 a Model T Ford roadster could be purchased for as little as $395. The Model T Ford was the first car for many Americans.